I think that everyone has a favorite book from childhood; maybe not a favorite, but that one book that follows them and they remember. 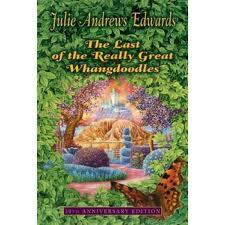 One of the books from my childhood is The Last of the Really Great Whangdoodles. I can picture the blank looks. Almost no one has heard of this book. Anyway, Whangdoodles is over thirty years old and it’s written by Julie Andrews Edwards, and nearly everyone knows who she is. Julie Andrews starred in The Sound of Music and Mary Poppins; she had a fabulous voice, with a four octave range. Unfortunately, a surgery left her without most of her range and now, most might recognize her as the Queen from The Princess Diaries. More to the story- my family had one copy that was hardcover, and had a handwritten note in it to my mother from her teacher (don’t remember what grade), and then we had to buy a paperback version. Both copies of the book were lent to my aunt and misplaced years ago. But the book has been on my mind for the past two and a half months; I wanted another copy to read, because I wanted to be able to read it to my baby. But, when a book is over thirty years old, you don’t tend to find it on the bookshelves of Barnes and Noble. At least, not the ones in New Jersey. I did finally find it when I was shopping with my boyfriend in New England. I finally started reading it to my son and we’ve only gotten through a few chapters so far, but when I read to him, he kicks and moves around, and when I finish the chapter and say ‘That’s all for the night,’ he settles down and rests for the night. He used to wait until I was almost asleep and then start doing flips. Now, I kind of want to find a Whangdoodle plushy, but I don’t think those exist. What a delightful review of one of my favorite books! Your little guy might enjoy the Dumpy the Dump Truck books when he’s a little older, by Julie and her daughter Emma Walton Hamilton. One or two of the picture books in that series are still in print. Your bookstore can likely bring them in on special order for you if they don’t have them in stock.